I’m running a workshop for the Glasgow Tarot Meetup Group at the beginning of April on using the comparative method of working with the Tarot. I first heard about this method from Valerie Sim and the Comparative Tarot deck that she created specially for it. I though that it would prove an interesting exercise to do with the court cards, here on m’blog. 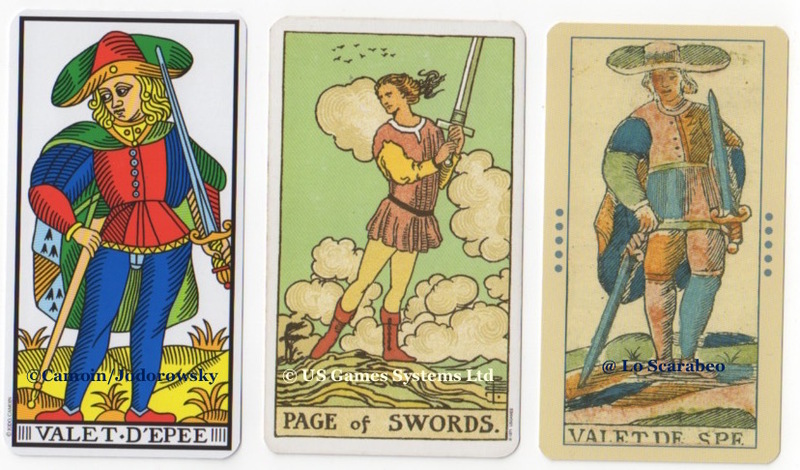 From the left we have the Valet d’Epee from the Camoin/Jodorowsky Marseille deck, then the Page of Swords from the Rider Waite Smith in the centre and the Valet De Spe from the Ancient Tarot of Bologna on the right. They all have different names, but henceforth I shall refer to them all as the Page of Swords, for ease of reference. What do the books say about them? Tarot de Marseille Jodorowsky/Camoin – The deck’s LWB is silent on entire Minor Arcana. But in his book The Way of The Tarot, Jodorowsky uses the words: ‘foundation of intelligence’, ‘student or young seeker’ ‘caution’. So our Pages are most definitely associated with intelligence, a Swords’ suit trait. But also perhaps with secret intelligence too – spying, secret service, surveillance, investigator etc. What can we actually see in these cards? They are each looking to the left, which I associate with the past. Perhaps they are each looking over their shoulder. We look over our shoulder when we are being wary. They each hold a sword in their left hand. The left has always had slightly sinister (did you see what I did there?!) overtones. Our little valets could, in theory, shake your hand (traditionally the right hand is proffered …unless I’m shaking hands with you and then, being a leftie m’self, I extend my left hand!) and stab you in the arris with a cunningly concealed left-handed stroke! Two of them have empty scabbards, so we could say that they have drawn their swords and are alert to attack. They each have their feet pointing in different directions, the Page on the right is on a path and, for me, this means that he is not certain which way to go. This lack of clear direction is most obvious in the RWS Page whose body language is clearly carrying him forward, but his gaze is behind him. They all stand on uneven ground. In the RWS I associate that rolling landscape underfoot with a lack of confidence or experience. That could also apply to the other youthful Pages too. The RWS Page is quite different in many respects – without a hat, cloak or scabbard. He seems altogether more theatrical than the two Marseille Pages. He does, of course, come from a period much later than the two Marseille decks (being printed in 1910). The Camoin deck original dates from 1760, with the Bologna version from the 1780s).